The Corps of Army Music (CAMUS) is a Corps of the British Army which was formed in 1994 following the Defence Review Options for Change, with the decision made by the Executive Committee of the Army Board (ECAB) on 18 November 1993 (FOI 2015/04139). Bands wear the cap badges of employing Corps and Divisions or Regiments of Infantry. The primary role of Army Bands is to play music in support of the Army’s moral component and to assist in its engagement with civilian communities. This musical contribution can be at home or abroad. Today’s modern Army musicians are extremely capable and multi-talented. Not only are there marching and symphonic concert bands but almost any other musical ensemble from Strings to Rock Bands. The role of Army musicians is varied, from parading in marching bands outside Buckingham Palace to performing for the troops in operational theatres such as Afghanistan. The Corps of Army Music has approximately 780 personnel. In addition to the regular bands, most Infantry battalions maintain their own independently administered musicians, either in the form of the Corps of Drums (for English and Welsh regiments) or the Pipes and Drums (for Scottish, Irish and Gurkha regiments). The Corps of Drums of an infantry battalion will usually feature drummers, buglers and flautists, while the Pipes and Drums will be formed of bagpipers and drummers. These bands are descended from the drummers and pipers who led infantry regiments in columns (first documented in 1854 at the Battle of Balaklava), and who used their drums or bugles to sound orders on the battlefield. Unlike the regular bands, these are first and foremost fully trained Infantry soldiers who form one of the battalion’s specialist units, such as the mortar, anti-tank or machine-gun platoon; as a result they are not part of the Corps of Army Music. Royal Military School of Music (RMSM). Both the ASBM&HD and DW form part of the Infantry Training Centre. The RMSM forms part of the Corps of Army Music. All three schools form part of the Army Recruiting and Training Division (ARTD), commanded by the Director General Army Recruiting and Training (DG ART), a Major General (OF-7), who in turn reports to the Commander Force Development and Training (FDT), a Lieutenant General (OF-8) (Figure 1). Founded in 1910 as the Army School of Piping (later renamed the Army School of Bagpipe Music), the Army School of Bagpipe Music and Highland Drumming (ASBM&HD) is located at Inchdrewer House near Redford Barracks in Edinburgh, Scotland. ASBM&HD is administered by the Infantry Training Centre, in Catterick, and is also affiliated with the Corps of Army Music. Generally regarded as the smallest unit in the British Army, ASBM&HD is commanded by a Director who is a qualified Army Pipe Major and who usually holds the rank of Captain (OF-2) or Major (OF-3) (usually being commissioned from Warrant Officer Rank on appointment). The Director is assisted by a Chief Instructor, who is the Senior Pipe Major of the British Army. ASBM&HD offers courses in Scottish bagpipe music to military pipers, drummers and pipe bands at all levels for members of any Regular Regiment in the British Army that has pipes and drums. ASBM&HD instructors’ are drawn from the pipes and drums of various units in the British Army and accepts students from Commonwealth armed forces, but not civilians. It has in the past provided instruction to various police band members, but this has not taken place for a number of years. The School forms part of the Piping and Drumming Qualifications Board (PDQB, 2011), which is a collaboration of the Piobaireachd Society, the Royal Scottish Pipe Band Association, the College of Piping, and the Piping Centre. Together, the Institute sets a standardised piping certificate programme for students from around the world. Additionally, the ASBM&HD provides support to community engagement and recruiting events, as well as monitoring the standards of each unit’s pipes and drums. Co-ordination of all joint events involving pipes and drums (such as The Royal Edinburgh Military Tattoo) is also undertaken at ASBM&HD. The teaching of Army pipers began in 1910 at Cameron Barracks, Inverness with the Army supplying the facilities and the Piobaireachd Society (a civilian organisation) for the instructor. The School’s title was ‘The Army Class’ and remained at Cameron Barracks until 1914 before moving to Edinburgh Castle. The partnership with the Piobaireachd Society continued until 1958 when the Army decided to appoint a full time military instructor. In October 1959 the Army School of Piping was founded, Pipe Major (WO1) John MacLellan, Seaforth Highlanders was appointed as Chief Instructor. In 1968 the post of Director of Army Bagpipe Music (DABM) was created and the School’s title changed to The Army School of Bagpipe Music. The Piping and Drumming Wing was formed in April 1995 with the closures of Divisional Piping Schools, namely the Guards Depot Piping School, The Scottish Division School of Music and the Irish Depot, Ballymena. This combined school was situated at Milton Bridge Camp, Glencorse Barracks, Penicuik and became the centre for basic piping and drumming training in conjunction with advanced drumming courses. The advanced piping courses were still being conducted at Edinburgh Castle. On the 1st April 1999 the Army School of Bagpipe Music and the Piping and Drumming Wing, Milton Bridge were merged to become the Army School of Bagpipe Music and Highland Drumming (ASBM&HD), forming a detached group within the Infantry Training Centre at Catterick. ASBM&HD is currently enjoying the surrounds of its new School of Excellence at Inchdrewer House which is a magnificent old listed building situated to the west of Redford Infantry Barracks, Colinton, Edinburgh. The house has been specially adapted and suits very well to piping and drumming. Courses held at ASBM&HD are varied and begin with the basic Class 3 Pipers and Drummers Course where no previous experience is required. This is a full 22-week programme, incorporating piping or drumming/bugling, band drill and highland dancing. Attendance at any of these courses is open to all Regular Regiments of the Army with pipes and drums. The Army School of Ceremonial (ASC) forms part of ITC Catterick and includes the Drumming Wing and the All Arms Drill Wing. The Drumming Wing teaches musical skills from scratch. The All Arms Drill Wing runs courses covering drill for Junior Non-Commissioned Officers (NCOs) and Senior NCOs. Class 2 and 3 Drummer’s Course: lasts 18 weeks and runs twice a year. The course has maintained a thin thread of military training which covers basic Military Annual Training Tests (MATTs) culminating in a section competition. Students also take part in a charity event which they organise themselves. The aim of this is to do something for a local charity of the students’ choice and provide them with a sense of achievement at the same time as raising the profile of the Drumming Wing. Class 1 Drummer’s Course: lasts two weeks and runs twice a year. The course involves the student looking in depth at transposing and writing music for a Corps of Drums. The course has recently merged the Defence Instruction Techniques (DIT) module which has given the course more strength and, in conjunction with the Drum Majors’ Drill Course, qualifies substantive Corporals for promotion to Sergeant. The provision of military music for the British Army is provided by the 22 bands in the Corps of Army Music (CAMUS) and 19 Reserve bands. The home of CAMUS is Kneller Hall, Twickenham in Middlesex, a site that encompasses the Headquarters, Corps of Army Music and The Royal Military School of Music. The role of the Headquarters is to give direction and professional advice on Army music matters and develop and sustain the ethos of Army musicians. The Royal Military School of Music (RMSM) occupies Kneller Hall and is recognised as the home of Army music since its foundation in 1857. Director Corps of Army Music: CAMUS is commanded by the Director CAMUS, a Colonel. Principal Director of Music (Army): The Principal Director of Music (Army) is a Lieutenant Colonel. Commandant of the Royal Military School of Music, also Director CAMUS. The Phase 2 Musicians Course is delivered by Rendle VC Troop at RMSM and provides Phase 2 training for all soldiers joining CAMUS and is undertaken after completion of Phase 1 initial training. Trainees on the CAMUS Phase 2 specialist training course can undertake coursework to assist them in gaining external civilian qualifications through CVQO. The BTEC level 2 and level 3 courses cover areas related to the work required of a musician in the Army. CVQO (2014) is an education charity and recognises activities and roles carried out within uniformed organisations and Youth Movements. There are opportunities for all trainees to perform both as a soloist and as a sectional player. Instrumental and academic instruction is delivered by a highly dedicated and experienced team of professors, many of whom are key performers from top professional orchestras and ensembles from around the UK. On successful completion of training, Musicians will be assigned to a Regular Army Band. There are a number of career development courses for trained musicians within the bands to assist in advancing their careers. This includes the Command Leadership and Management (CLM) programme of courses and the new Music Direction courses. Music Direction Skills: provide the framework for the course which develops the student in both ceremonial and concert conducting. Development of technical and stylistic conducting. Orchestration Skills: provide students the underpinning knowledge of the interrelationship between instruments within the parade and concert band in order to be an effective conductor – both in rehearsal and performance. Harmony: training in music harmony provides students the understanding of the concepts of music harmony integral to both written and aural music analysis. History and Analysis: training in history and analysis provides students the knowledge of the development of western music to support musical analysis and score preparation. Teacher Training: training in teaching, coaching and mentoring skills provides students the capability to deliver individual and group training. Military Band Studies: training which develops the student as a Bandmaster; providing the functional and administrative skills necessary to lead a Regular Army Band. The cost per soldier recruit for Phase 2 training for the Corps of Army Music is currently unknown. Audioboo (2011) Catterick: Army School of Ceremonial, Part 1. Available from World Wide Web: https://audioboo.fm/boos/375321-catterick-army-school-of-ceremonial-part-1. [Accessed: 25 March, 2014]. British Army (2013) Changes to the Corps of Army Music. Available from World Wide Web: http://www.army.mod.uk/news/25654.aspx. [Accessed: 25 March, 2014]. CVQO (2014) About Us. Available from World Wide Web: http://www.cvqo.org/what-we-do/about-us/. [Accessed: 25 March, 2014]. 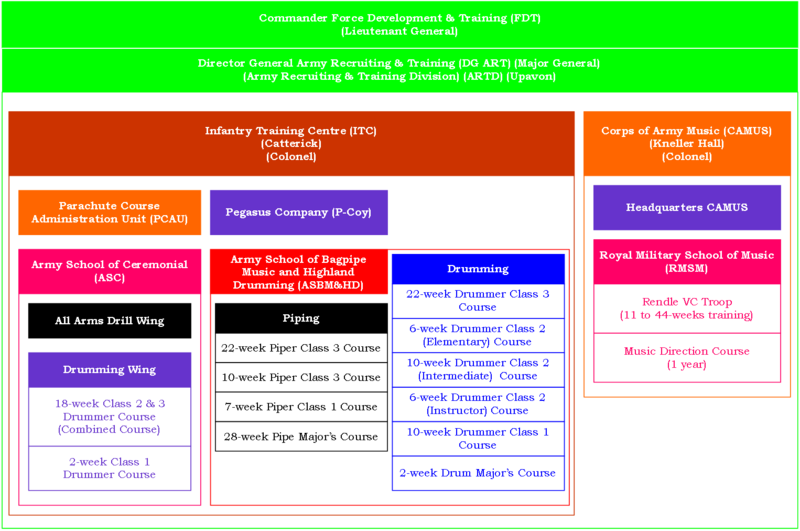 PDQB (The Piping and Drumming Qualifications Board) (2011) Home Page. Available from World Wide Web: http://www.pdqb.org/. [Accessed: 25 March, 2014]. wondering. What chances I have of joining. The British Army and is there an age limit. i. Citizen of a Commonwealth country or holding British Overseas Territories Citizenship. ii. Individuals must have Indefinite Leave to Remain in the UK or have resided in the UK for five years before they can start an application to join the British Army. iii. Individuals must not have been out of the UK for a continuous period of more than 180 days (6 months) during this five year period. i. Entry into the Corps of Army Music (CAMUS) is by audition. ii. You need to be between 17.8 and 36.11 years to join the Regular Army, and 17.9 and 42.11 for the Army Reserve. i. You can only apply for this job if you are already serving in the Army, all Infantry musicians are fully-qualified Infantry soldiers. ii. The main role of a trained Infantry Musician is as a combat soldier. iii. You need to be between 16 and 32.11 years to join the Regular Army.